It would be unthinkable for any automaker but Porsche to introduce a new car with a flat-6 engine hung out behind the rear axle. At this week’s 2018 LA Auto Show, the 2020 Porsche 911 duly made its debut in the hallowed configuration that has persisted since 1964. But with underpinnings specific only to one model, the new 911 is a major outlier in the global auto industry. Far more common is what’s known as “platform sharing,” in which several models and often several brands use common underpinnings with different bodies and interiors. With luck, buyers never know about or see the shared components. Shared platforms are crucial to the flurry of new battery-electric vehicles announced by Audi and Porsche. Porsche intends by 2025 to provide electric variants of all of its models except the 911 (which will get a hybrid); and Audi itself plans 12 fully electric vehicles by 2025, including, likely, multiple models for the brand built on Volkswagen’s mass-production-oriented MEB platform. 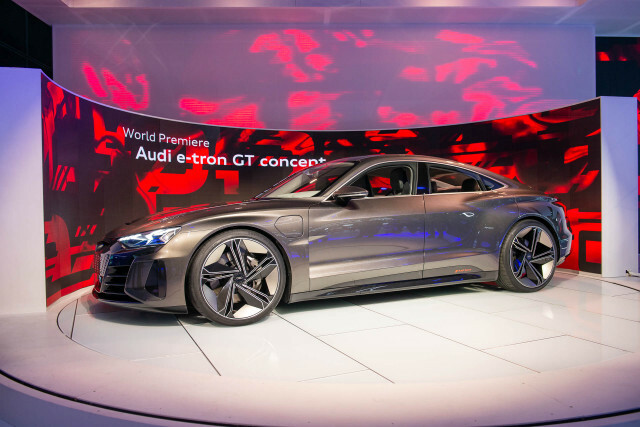 While the new 911’s global debut drew oceans of coverage, the sleek Audi e-tron GT electric sedan “concept car” that also debuted in LA demonstrated the reality: almost no vehicle is developed these days on a unique architecture. The VW Group, which owns Audi and Porsche, is one of the world’s four largest carmakers. It also may be the most frank about its strategy of sharing single platforms or architectures among multiple models. 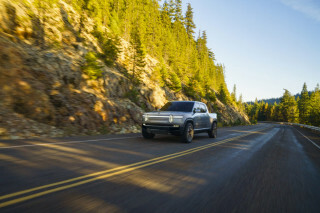 Its compact MQB front-wheel-drive architecture, for instance, will ultimately underpin dozens of vehicles from four brands that comprise 4 million units a year. The Audi e-tron GT represents a high-toned, pricey version of the same principle. 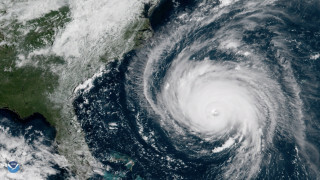 Its underpinnings date back to the 2013 arrival of the Tesla Model S, which landed like a global thunderclap and drove every carmaker to reassess its long-term plans for battery-electric vehicles. Among the most startled, and threatened, of high-end makers was Porsche that had long viewed itself as the world’s pre-eminent maker of sporting luxury vehicles. By that time, those ranged from the 911 coupe, to the Cayenne SUV, to the Panamera four-door sedan. Yet the Model S provided a combination of style, power, road-holding, and zero-emission driving that Porsche couldn’t equal. That was simply unacceptable. It was the spur that led to the debut of a striking Porsche Mission E all-electric sedan concept at the Frankfurt Motor Show in September 2015. The Mission E concept became the Porsche Taycan sedan that will go on sale during 2020, with a range of motor powers and a feature no other electric vehicle offers: an 800-volt electrical architecture that permits 350-kw fast charging, restoring up to 80 percent of a high-capacity battery in 15 to 20 minutes. The Taycan is built on Porsche’s own, unique electric-car platform, called J1. To boost utilization, Porsche plans to offer a shooting-brake version, shown in concept at last spring’s Geneva motor show as the Mission E Cross Turismo. But there’s a third variant riding on the same set of underpinnings. 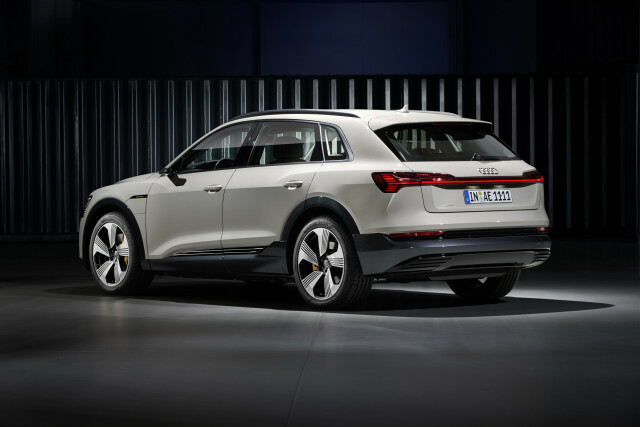 It’s just not a Porsche., The Audi e-tron GT unveiled at the 2018 LA Auto show has entirely different styling and a distinctively Audi interior, but apparently all of the same mechanicals. The arrival dates for these vehicles range from early 2020 (the Taycan, which will be followed by the Cross Turismo within a year or so) to 2021 for the Audi e-tron GT. The Audi e-tron, the automaker’s first all-electric production car, will be a compact to midsize SUV. The production design was revealed in September, three years after the debut of the concept at the same Frankfurt auto show in September 2015 that saw Porsche show the Mission E.
The Audi e-tron utility vehicle is built on an adaptation of the brand’s existing architecture for gasoline and diesel vehicles, known as MLB-Evo. The version for internal-combustion vehicles is designed around engines placed longitudinally for front- and all-wheel-drive, which makes the e-tron’s two transverse electric motors (one per axle) slightly ironic. The Audi e-tron SUV will soon spawn a sleeker version, called the e-tron Sportback. It’s also a utility vehicle, but with a more raked tail and less wagon-like lines. That vehicle was shown in China and elsewhere as a concept during 2016. The e-tron will arrive at Audi’s U.S. dealerships in late summer next year and is the first long-range battery-electric vehicle sold by any VW Group brand. The Sportback derivative likely will follow during 2020. 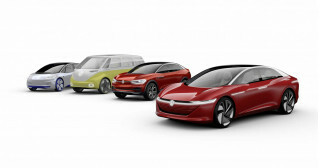 So that makes five battery-electric vehicles from VW Group’s two high-volume luxury brands. Given that Porsche shares its J1 platform with Audi, symmetry might suggest that Audi provide electric MLB-Evo underpinnings to Porsche for a future all-electric “high riding” vehicle, in the words of one Audi engineer. Indeed, that appears to be what will happen. That Porsche utility vehicle likely will be about the size of its Macan (the brand’s bestseller), but using an all-electric powertrain. 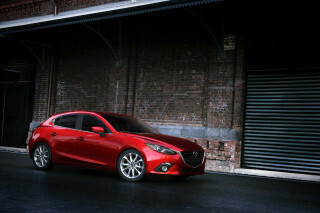 A concept version will probably appear at one of the big global auto shows sometime next year. Unlike the pair of Porsche Taycans, however, the Audi-derived Porsche electric crossover (and the two e-tron utilities) will be limited to 150-kw fast charging. That’s because the electronic architecture created by Audi was not intended to accommodate anything higher. While the first of these vehicles are likely to start appearing at dealers next summer, the platforms they ride on may not last for the two complete generations that VW Group plans for all its high-volume architectures. Instead, Audi and Porsche are now collaborating on development of a next-generation platform for larger all-electric vehicles capable of very fast charging. It’s called PPE, and each of the makes is responsible for different aspects of the shared specifications. Porsche, for instance, is the lead brand for the charging system, since it pioneered the 350-kw charging that uses an 800-volt electrical architecture. Audi will have its own spheres of responsibility, although we gather the discussions among the two brands’ engineers—each justifiably proud of their way of approaching vehicle design—has been spirited at times. 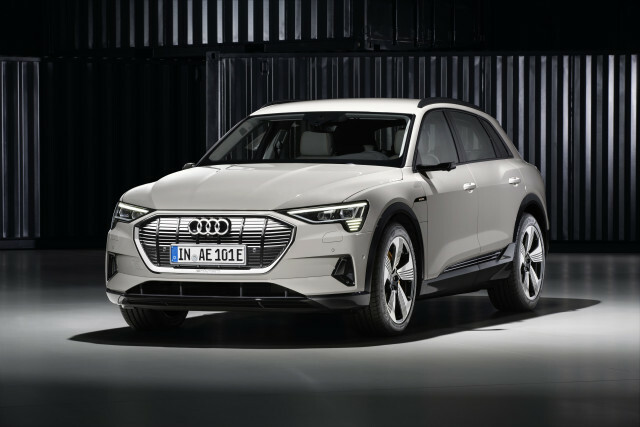 Nevertheless, by this tally, Audi and Porsche together will have at least six new battery-electric vehicles on sale globally by 2022 or thereabouts. That’s six more than they offer today, and unlike Porsche’s flagship 911, they share quite a lot under the surface. Which, if the engineers and designers do their jobs properly, no buyer will recognize.